A PLAN-Boulder County forum on Friday, April 26, about the City of Boulder’s proposed historic preservation plan turned into a spirited and occasionally heated discussion among panelists and audience members about the merits of the city’s current historic preservation program, with some decrying and some denying its purported lack of consistency and others expressing either support for, or opposition to, the creation of more historic districts. One of the forum’s panelists, James Hewat, Boulder’s senior historic preservation planner, explained that work on the proposed plan started in December, 2012, and is intended to both assess the current historic preservation program and guide its course for the next 10-15 years. The plan is funded by a Colorado local governments grant and is expected to be presented in its final form to the City Council in late July for review and probable acceptance. Public opinion is an important component of the development of the plan, and Hewat said that several public meetings have already been held about it. The Landmarks Board will scrutinize the draft plan in May, June and early July before it is completed and sent to the council. Hewat declared the plan’s developers have already determined that Boulder’s historic preservation program compares favorably to other such programs in Colorado and the rest of the United States. It includes the most comprehensive historic survey program in Colorado, he said, and has been commended for the effectiveness of the Landmarks Board’s design review committee (DRC) process, its success in securing grants, its tax credit review process, and its innovations in integrating historic preservation with energy efficiency standards. However, he said that the plan’s developers had recommended improvements in some areas, such as more public outreach and education efforts, additional incentives for historic preservation, establishing post-disaster response and recovery processes, and continuing diligence in keeping surveys of historic resources current. Another forum panelist, Catherine Schweiger—who helped to organize the Mapleton Hill Historic District 40 years ago, but more recently has become a critic of the city’s historic preservation program—noted that the University Hill and Whittier neighborhoods have generally resisted proposals for historic districts. She claimed that the historic preservation program suffers from “mission creep,” and that the Landmarks Board has been inconsistent in its decisions on applications for alterations to structures in historic districts. She cited the case of proposed alterations to her son’s home in Mapleton Hill, which were ultimately approved by the Landmarks Board but only after several iterations with the DRC, although similar alterations had been allowed to a house that is located nearby. She called for a “clear, predictable and consistent review process” and predicted that additional historic districts would not be founded until the process is reformed. Schweiger conceded the review of proposed alterations to “non-contributing” buildings in an historic district is considerably more challenging than of proposed alterations to “contributing” buildings. One member of the audience who said he lives in the Whittier neighborhood blurted out, “My neighbors are scared to death” of a historic district. Another audience member declared that she is “daunted and fearful” of the possibility of a historic district in her neighborhood. However, audience member Jyotsna Raj, who helped to instigate the one-block historic district around St. Thomas Aquinas Church, insisted that a historic district for most or all of University Hill needs to be seriously considered. (One was provisionally established and then quickly rescinded in the late 1990s due to widespread neighborhood opposition.) Hewat commented that several smaller historic districts in the “Hill” are probably a more politically realistic possibility than a single, large one. Forum panelist Kathryn Barth, who was representing Historic Boulder, noted that the members of the Landmarks Board’s design review committee change over time, and that the turnover could cause inconsistency. However, the fourth forum panelist, Mark Gerwing, an architect who is the chair of the Landmarks Board, generally defended the board’s alteration certificate review process. “Every property is really different,” he said. “There is not a consistent set of values that can be applied.” He asserted that siding or roofing material that might be appropriate on one particular house might not be on another with a different style, even though the two might sit side by side. “We’re nobody’s friend,” he lamented. “We either don’t protect enough or we protect too much.” But he claimed that 90 percent of the projects reviewed by the board are “successful.” He also boasted that a property owner does not need an architect in order to deal with the design review committee, and that, unlike most other communities, a property owner can approach the committee with just a sketch, not detailed plans. Gerwing claimed that the city’s demolition review and stay ordinance causes the Landmarks Board the most administrative difficulties. It requires that the city review every demolition application for structures over 50 years old; and, if the board concludes that the structure has historic value, it must delay the demolition for up to 180 days in order to allow the city time to try to save the building. This rescue effort could include the initiation of a landmark designation, thereby making demolition more difficult. Gerwing and Hewat both asserted that they would like to revise the demolition ordinance. But Hewat said that the City Council has repeatedly declined to make such a revision a priority for the staff. Hewat remarked that the last change to the city’s historic preservation ordinance took three years to be adopted. Gerwing claimed that he and every other member of the Landmarks Board started their terms determined to make a number of changes to the preservation ordinances and processes. Then inevitably each one, including himself, realized that historic preservation is complicated and that improvements to the city’s preservation program are tricky. Some audience members proposed that the city’s requirement that demolition permits for buildings 50 years or older be reviewed should be relaxed so as to cover only buildings 60 or 70 years old, or older. However, Barth responded that loosening that requirement would disqualify Boulder as a “certified local government” under the state and federal historic preservation statutes. Hewat explained that the city’s loss of its “certified local government” status would mean that property owners who spend money on historic restoration would have to follow state procedures to claim tax credits and that the state procedures are much more burdensome that the city’s. Hewat also noted that the city’s ordinances permit demolition permits for buildings completed after 1940 to be reviewed only by a staff member, rather than a staff member and board members, thereby simplifying and speeding the review. The forum moderator re-iterated a proposal which he said he had first offered in the 1990s: have the city buy a relatively pristine block of homes in Martin Acres, install families in them at attractive rents who would pledge to maintain a 1950’s lifestyle, and open up the block once a month or so to outside visitors who could tour it and learn about that era—a more modern version of Colonial Williamsburg or Sturbridge Village. 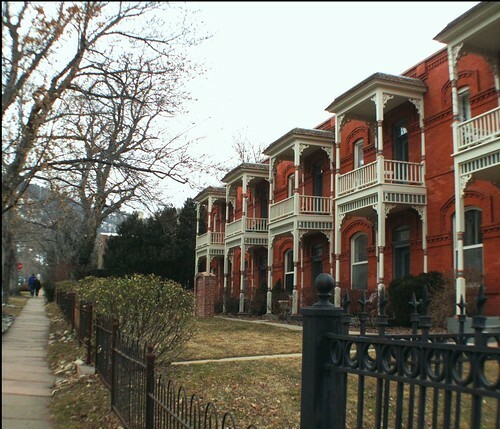 Then allow the rest of Martin Acres to be redeveloped with no historic preservation restrictions. Barth commented that historic preservation constitutes a major form of land use control in which PLAN-Boulder County should be more involved. She called for a PLAN-Boulder representative to attend each meeting of the Landmarks Board and to state positions on landmarks issues, when appropriate. Audience member Ken Foelske deplored what he perceives to be the deterioration in the maintenance of public spaces in Boulder. “There used to be real pride in the streetscapes,” he said. He asserted that streetscapes are critical to the quality of life in a city and called upon the Boulder city government to take the lead in restoring them to their original beauty. Despite the numerous criticisms, most—if not all—of the panelists, and many—if not most—of the audience members concurred that the city’s historic preservation program has, on balance, caused it to be a better place in which to live.